The long-awaited closure of Covert Avenue begins at 5:00 am on Monday, April 15th, putting New Hyde Park at the epi-center of this $2 B mega-project. This highly disruptive project will transform New Hyde Park forever; eliminating the crossing gates that have caused countless hours of delays, deafening horn blasts and far too many deaths throughout its long history. The result will be a much safer, more appealing crossing where the road and railroad track will never again meet. This is a very good thing. As many of you are aware, the LIRR Third Track Project is taking a greater toll on our village as construction activities accelerate. Not least among the many adverse impacts that New Hyde Park is enduring because of this regional project, is the diminishing parking resources to commuters at the railroad station. Here is a brief update on some of the recent activities in New Hyde Park. This past week the Village Board held a public hearing and amended the Village Code requiring any sale of marijuana or marijuana related products to be confined to the Adult Use Zone in the village if the sale of marijuana is legalized in New York State. Should the state legislature legalize marijuana, the village would not be permitted to prohibit its sale; we can however restrict where it can be sold under local zoning code. We were informed last week that the road closure of Covert Ave originally scheduled to Start on January 29, 2019 thru February 2, 2019 was cancelled and rescheduled. We have been informed by 3TC that on or about Tuesday, February 5th, Covert Avenue will be temporarily closed between 1st Avenue and 2nd Avenue. The daily closures will take place from 7:00 a.m. to 4:30 p.m. and will end no later than Tuesday, February 12th. During the times that Covert Avenue is closed, two detours will be available to non-commercial vehicles. Southbound drivers on Covert Avenue will be directed to South 6th Street. Northbound drivers on Covert Avenue will be directed to South 8th Street. Flaggers and MTA police will be present. Please see the map for details. Commercial vehicles will be required to detour to New Hyde Park Road. Here are a few updates from this past week on some items impacting New Hyde Park. Trustee Rainer Burger, Deputy Village Attorney Peter Trendecost and I attended a monthly Mayor’s Meeting with the LIRR and their design-build contractor, 3TC on Wednesday, January 16th. LIRR officials provided an update on the mega-project that is coming quickly into focus – like a speeding train approaching the crossing. Please see important information in the LIRR Third Track Bulletin on this site. Night work will be performed on Tuesday and Thursday night (January 15th and January 17th) in and around the intersection of Third Avenue and Wayne Avenue and on Second Avenue at South 6th Street, just north of the tracks. The work will be done from 10:00 pm through 4:00 am the following morning. Lights and generators, trucks and personnel will be moving about the site. Crews will be working to relocate electrical utility lines away from Covert Avenue, so they will not be in the way when reconstruction of the Covert Avenue crossing begins in March. The Village of New Hyde Park is deeply saddened at the tragic loss of life and property that occurred this weekend in a house fire on North 12th Street in our village. Our thoughts and prayers are with the family of those who have lost so much. We sincerely appreciate the heroic efforts by the volunteers of the New Hyde Park Fire Department in responding so quickly for their courage and professionalism. Residents can begin to purchase the 2019 Resident Parking Permit on Monday, December 3rd at Village Hall The cost remains unchanged at $100 for the annual parking permit. Today we learned from 3TC, that they will begin taking down over 30 trees along Covert Avenue; north and south of the railroad grade crossing between First and Fifth Avenues. They explained that the trees must be removed “…to make way for utility relocations in anticipation of the work on Covert AS WELL AS the under-grade crossing.” 3TC added that every tree removed off of the LIRR right of way will be replaced. The tree removal may begin as early as Friday, October 26th. The Village of New Hyde Park will host another in a series of public information sessions about the LIRR Third Track Project. We will have presentation from the LIRR and Third Track Constructors (3TC), the design-build consortium that has the contract to perform the work. The meeting will be held at the New Hyde Park Road School auditorium located at 300 New Hyde Park Road on Thursday, September 13th at 7:30 pm. 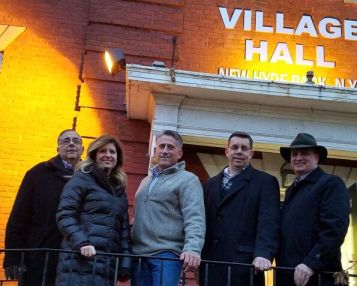 Thanks to the efforts of NYS Senator Elaine Phillips, the Village was recently awarded two capital improvement grants totaling $350,000. The larger of the two grants, $250,000 will be used for infrastructure improvements at Village Hall, including the installation of a new HVAC system and façade improvements. Although no decisions have been made by the Village Board at this time, projects under consideration for the second grant ($100,000) include road construction or additional facility renovations at Village Hall. The Village Board appreciates the assistance and support from Senator Phillips on the many issues important to this community. This site is to provide residents and visitors with information about our community, our people, our life in the Village. Please feel free to stay awhile and contact us if your have any other questions.